This is my favorite time of year! The smells, the sounds, the outfits! 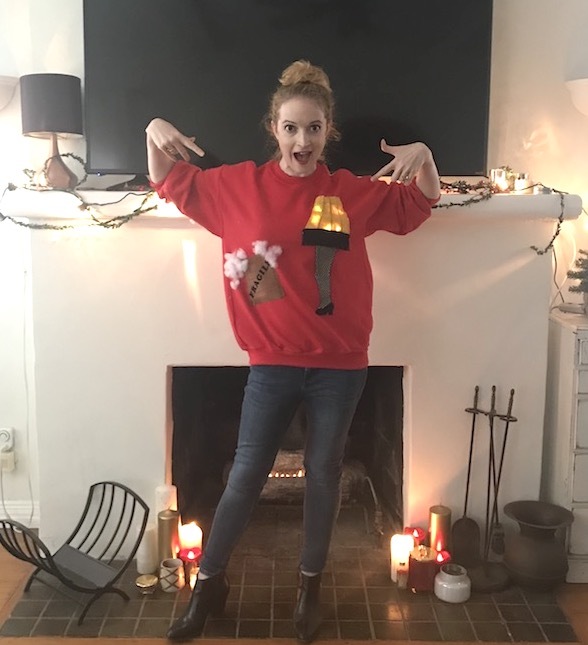 I have a slew of vintage sweaters that are coming out for the holidays, but what to wear for the office ugly sweater party?? I’m going to DIY the ultimate piece inspired by A Christmas Story that’s on repeat in my household all Christmas day! I grew up watching A Christmas Story and there are so many iconic scenes (the tongue on the lamp post still gives me agida!) but my favorite involves the leg lamp that Ralphie’s dad orders! I think I was obsessed as a kid with this lamp purely because it was a leg with a stiletto! But I’m using the leg as inspiration for my project and need to score all the supplies to recreate from JOANN. I grabbed a red sweatshirt (ugly sweatshirt party sounds about right! ), felt, fringe, mesh fabric, fabric glue, velvet ribbon, iron-on lettering, and an LED light necklace to get this project rolling. I started with a template of the leg lamp I found online. I’m not the best freehand artist, so using a pattern was the best move for me! I trimmed it into three main portions - the shoe, the leg, and the lampshade - that will be traced onto the coordinating fabrics. I started with the leg and used a light beige felt! (Felt is used for all three portions of the lamp just because it’s a bit sturdier.) I traced then trimmed out my fabric. I moved onto the shoe next! I grabbed adhesive-backed black felt for this piece and traced and trimmed. 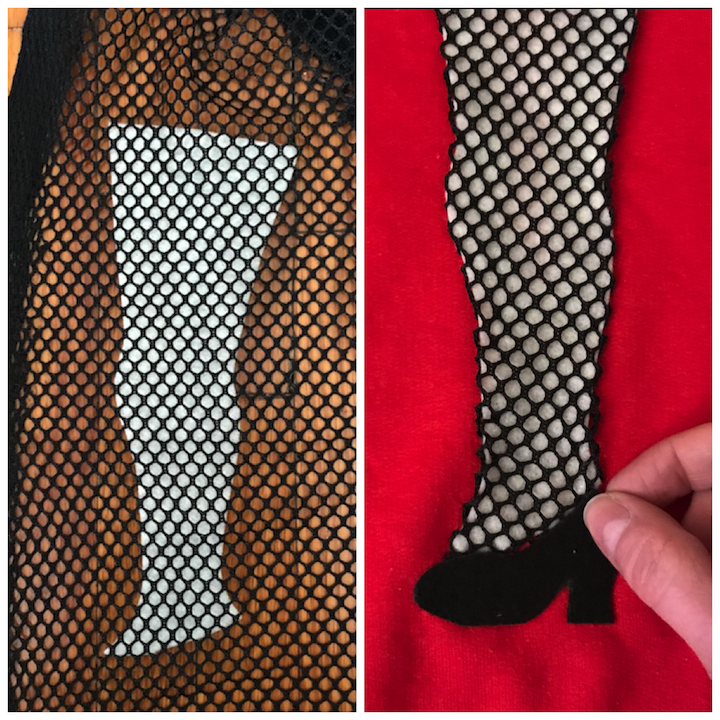 The leg was cut out, but it was missing a very important part...the fishnet tights! I found a mesh fabric that I wanted to place on top of the felt to give it a fishnet vibe. I placed the mesh on top of the felt and then trimmed and tucked the edges. Next came applying it to the sweatshirt along with the shoe which I affixed with fabric glue. Next came the lamp! I cut out a basic trapezoid-esque shape and wanted to give the shade a bit of a 3D feel so I took some matching velvet ribbon and glued down three lines to make it look like boning of sorts. With the leg and shoe attached, it was time to move the lampshade to the sweatshirt! And the lamp needs her fringe, so black fringe was added to the bottom of the lamp right off the bat. BUT, this is the coolest part of the sweatshirt. I wanted the lamp to light up, so I put some LED lights from a cute light up necklace right under the felt lampshade! This was the only portion of the sweatshirt that I sewed. I started stitching down the left side of the felt piece going counterclockwise around the shade. As I stitched, I kept molding the lights in areas I wanted them to shine (and pushed them into place) as I went around the edges. Once I was happy with the light placement, I made my way around the rest of the shade and then made little stitches on the ribbon in the center to keep the lights in place. There’s a push button to turn the lights on that I placed at the top of the shade for easy access. And there’s only one more piece to the sweatshirt puzzle to finish! A box with the letters FRAGILE (“fra gee lay”) on it, just like the one the leg came in, in the movie. I bought some brown corduroy and trimmed seven rectangular panels to form a box and layered two on each edge. I took small iron-on letters and placed them on a diagonal to cover the box and ironed in place. The final bit of flare? Some “packing material” for the box which is just pillow stuffing. Stitch or glue...whatever tickles your fancy! The final look was complete! I am SO in love with how this turned out! 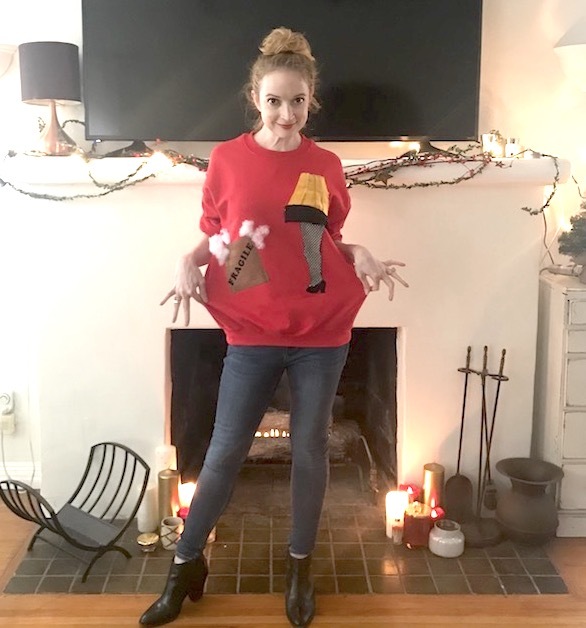 The perfect piece to wear to my ugly sweater party! I promise you won’t shoot your eye out! 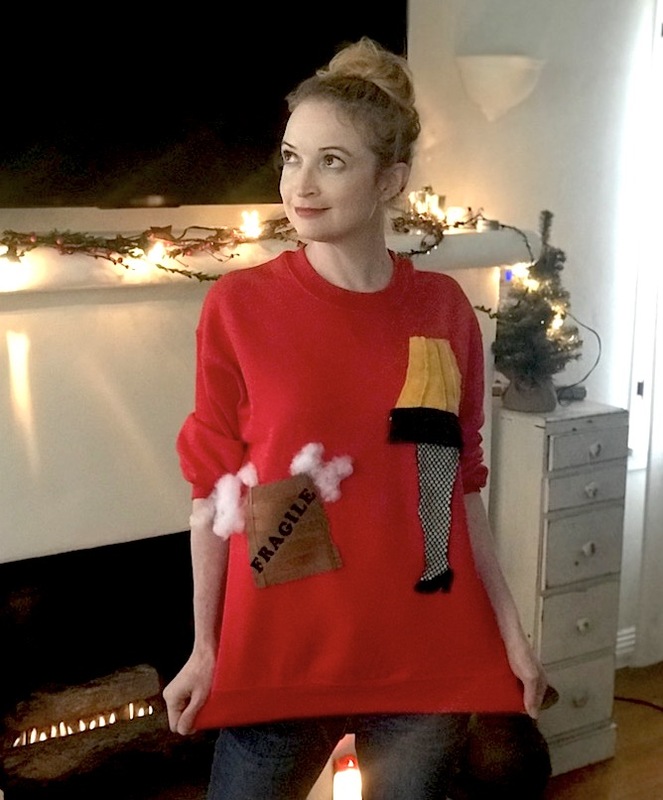 You’re guaranteed to win Christmas with this interactive holiday sweater! I “double dog dare you” that you won’t have the most fun wearing this! !